These homes and condos accept pets with limitations. The size allowed and number of pets will vary by home. We can only accept dogs, no cats or other animals. Our pet policy applies to all rentals that accept pets. Please contact us with your specific request for approval. A pet fee does apply, the amount shown on each property is the fee for each dog based on up to a 7 night stay. Please review our pet policy under the guest services tab on our website. Harbor Front Condo - Fabulous location on Embarcadero! Beautifully and Comfortably Furnished! Beautifully Remodeled Home. High-End Furnishings. 3 Blocks to Beach on Ocean Side of Freeway. 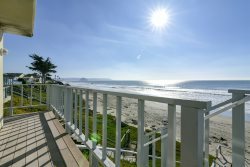 More Vacation Rental Homes in Morro Bay, Cayucos, Los Osos, and Paso Robles! Fabulous Custom Home close to Downtown. Great Views!